EVER WONDERED WHY RACECARS USE STUD & NUT KITS? 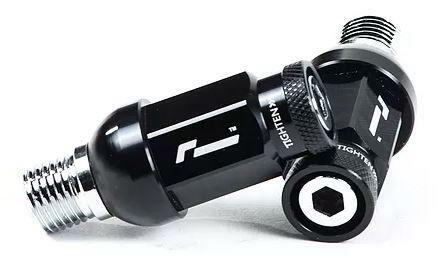 Replace those fiddly bolts with our high tensile stud & lightweight wheel nut conversion. Remove and install your wheels at the track all the time? Then you’ll know how frustrating the factory wheel bolts can be. Lining up the bolt holes, bashing the wheel against your beautiful brakes calipers, then cross-threading the bolts at the same time. All while balancing the weight of the wheel. 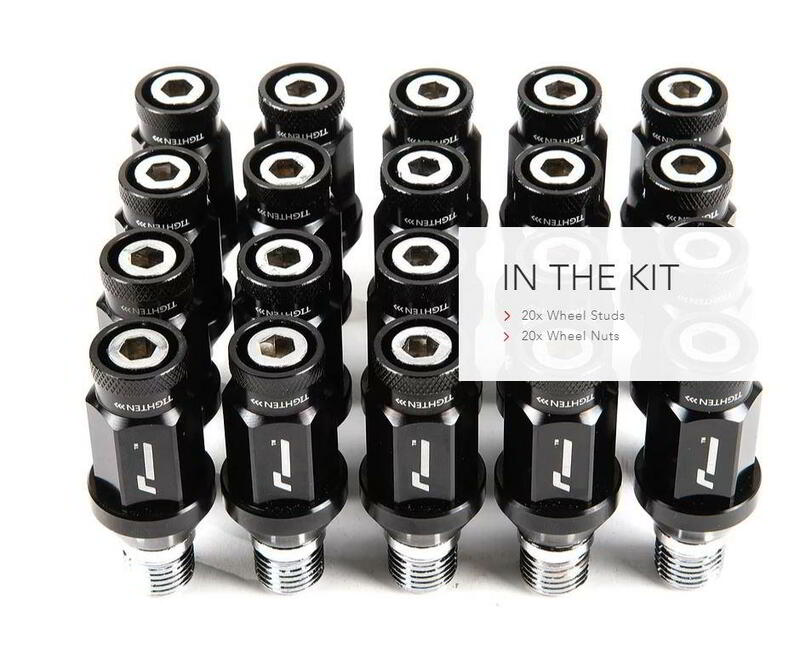 Our Stud & Nut kit gives a stronger fixing method than using the original wheel bolts. Plus they’re a much quicker method to swap wheels for motorsport / track use as well. Converting your car to our Stud & Nut Kit is a simple, reversible upgrade that will speed up your wheel changes. Our Stud & Nut Kit also allow for the safe use of spacer size setups from 5-10mm without the risk of running out of bolt threads. Beautiful midnight-black gloss anodised finish on the nuts will smarten up your car’s looks as well as its practicality. Both conical and ball seat lug nuts are available to suit either factory or aftermarket wheels. 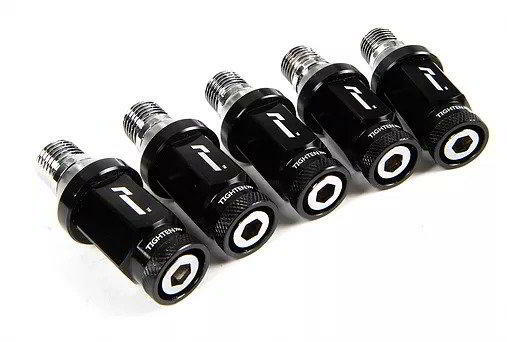 M14 x 1.5 High Tensile Steel Motorsport Studs and larger anodised Wheel Nuts exceed the strength of the factory bolts for ultimate strength and safety. Stud and Nut kits are suited to any car that sees track use with regular wheel swaps. The studs really help to speed things up when you are trackside. These studs screw in place of your original wheel bolts with allen drive inserts to make installation a breeze. Plus easily removed in future. 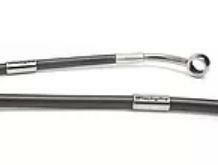 M14 x 1.5 heat treated high carbon steel stud with chrome plated finish. Lightweight M14 x 1.5 7000-series aluminium open-ended nuts with gloss anodised nuts. Internal 6mm allen stud drive for accurate fixations. Knurled outer collar for much easier finger grip. 8mm of unthreaded stud shank for brake disc clearance. Oversize 19mm nuts – greater surface area for contact & ease of use. The lightweight nuts are hand-polished before being anodised. The anodising protects the aluminium, and gives it its beautiful finish. However, as with all anodised finishes, it’s important not to clean them with aggressive acidic or alkaline cleaners otherwise this finish will be damaged. Use only pH balanced cleaners (ie, non-acid, non-alkaline, non-solvents). Never use ANY type of acid alloy wheel cleaner or any chemicals that include abrasive compounds on the nuts. We recommend washing with water and mild soap. We advise against using commercial carwashes who use aggressive chemicals such as TFR if you have any anodised parts that could be affected by the carwash. If in doubt, always carry out a test on a small area first and carefully follow manufacturer’s recommendations for mixing and diluting cleaners. 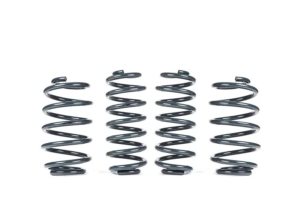 The VWR Sport Springs are one of our most popular upgrades, replacing the original factory spring set to lower ride height and improve dynamics. 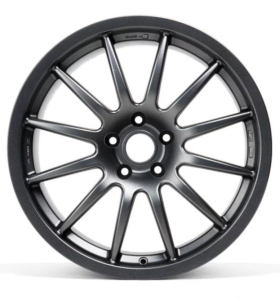 The exact wheels used on every Volkswagen Racing Cup car, in 8″ and 9″ fitment for the ultimate track rim. 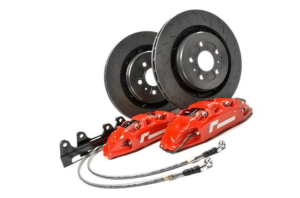 Our full Monoblock Performance Brake Kit for fast road cars will transform your braking ability and look stunning.